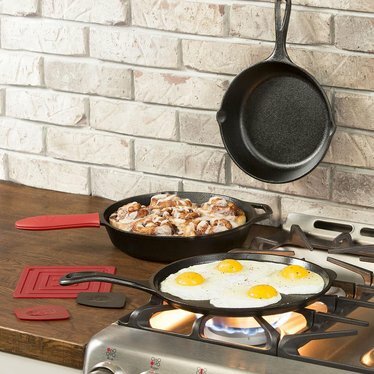 No one knows cast iron like Lodge®. Share the tradition of legendary cast iron cookery with your loved ones. 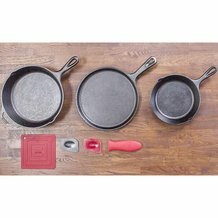 Starter set includes 8" skillet, 10-1/4" skillet, 10-1/2" griddle, silicone handle holder, silicone pot holder and two scrapers. 8" Skillet-Handle 4-5/8"L, overall 8-10/16"OD x 1-3/4"D, 3-3/4 lb. 10-1/2" Griddle-Handle 5-1/4"L, overall 10-5/8"OD, 4-3/4 lb. 10-1/4" Skillet (with assist handle)-Handle 4-7/8"L, overall 10-3/4"OD x 1-7/8"D, 5-1/4 lb. Silicone hot handle holder-Red, 5-5/8"L.
Silicone pot holder-Red, 5-7/8" square.